I’ve taught four of my children to read and it seems like they always need a bit of extra practice on their short vowels. 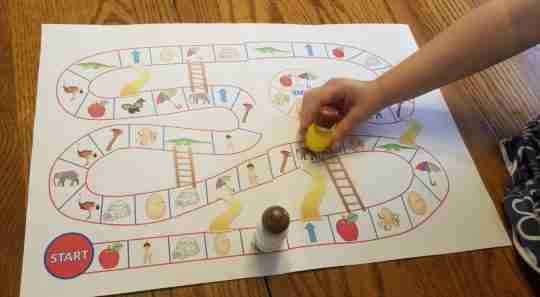 Children learn best when they are having fun so I love to come up with games that also sneak in learning. That is why I’ve created this Short Vowel Phonics Game. It’s a bit of a combination of Candy Land and Chutes and Ladders. There are two version of the game included. The first version has the pictures on the game board and you choose the cards with letters on them. The other version is the other way around. The letters are on the game board and the pictures are on the cards. Players take turns drawing cards. If you draw a card with one letter, you move forward by one picture that starts with that letter. If you draw a card with two letters, you move forward two pictures. If the final space that you land on is a slide or a ladder, go either up the ladder or down the slide. Rules for the second game are the same, except you draw cards with pictures instead of letters. Here are some other tips to teaching a child how to read. Lay a strong base in phonemic awareness. Let you child see you read often! Don’t rush early academics. Children are better off spending their time playing exploring the world around them than sitting at a desk and learning. This last point was illustrated to me again the other day. My daughter and I were outside by our pond on a particularly windy day. She was trying to throw leaves and pine cones into the pond, but the leaves kept blowing back at her. Finally, she turned to me and said, “The wind picks up the leaves, but it doesn’t pick up the pine cones.” Right there is learning at it’s best. The kind of learning about the world that they live in that our children need to experience each day. Click here to go to my shop to download your own FREE copy.